Your furnace is the primary source of heat during the winter. It can bring comfort to your entire household and keep you safe when the temperatures plummet. On the same token, the furnace can also be a source of toxic air that can affect you and your family's health without you even knowing it. Certain factors can determine both the condition of the furnace and the type of toxins it's releasing into your home. 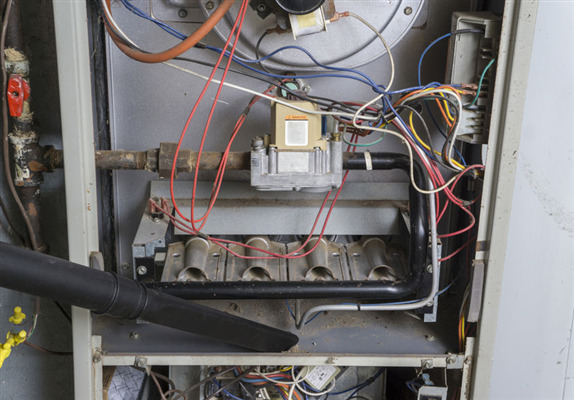 If your furnace is old and worn down, we recommend that you call an HVAC specialist to inspect the system. It may be time for a new furnace. A furnace should last 15-20 years. After two decades it will start showing signs of wear and tear. One of the first things you'll notice is that it's no longer operating efficiently. Thus, it's not producing the type of warmth needed to keep the house comfortable. If you compensate by turning the heat up, you'll find that your energy bills have increased. A new furnace will save you money and keep your house warm while using less energy. There is a connection between the condition of your furnace and the level of carbon monoxide (CO) inside your home. Furnaces produce combustion. The combustion produces carbon monoxide. A tiny amount of CO is acceptable in your home. High levels of CO, however, can lead to monoxide poisoning. Symptoms of poisoning include a headache, shortness of breath, dizziness, nausea, and other more severe health problems. Old furnaces produce dirty air and contaminants that can pollute a house. The dirty air circulates through the system, the ductwork, out the vents, and back again. Each time the air circulates, it gets dirtier. It can create a toxic environment that aggravates asthma or bronchitis and can lead to other respiratory problems. A brand new furnace will produce cleaner air and reduce pollution levels in the house. After you install the new furnace, you can keep the air pure by hiring Dust Doctors to perform an HVAC and duct cleaning. To keep the air clean in your home, Dust Doctors offers complete HVAC and duct cleaning services for homeowners in the Twin Cities area. We clean furnaces, ducts, vents, and also provide duct pest control cleaning. We can make your home a healthier and cleaner place to breathe. To find out more about our services, call us at 651-319-9777, or you can message us on our contact page. « How Do You Know if Your Air Ducts are Dirty?